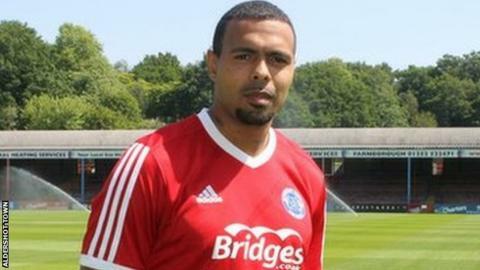 Kidderminster Harriers have extended striker Matthew Barnes-Homer's loan from Aldershot Town until 23 January. The 29-year-old Dudley-born former Wolves youth team player is in his second spell at Aggborough, after re-signing for the National League strugglers on 30 October. He has so far made three starts, but is yet to score for Dave Hockaday's side. Barnes-Homer scored 40 goals in 119 games for Harriers in his previous stay between 2007 and 2009. Harriers are back on the bottom of the National League following their narrow 1-0 defeat at high-flying Grimsby on Saturday, as a result of improving Halifax winning at home to Dover. Hockaday's Harriers are at home to Gateshead this Saturday before an FA Trophy trip to Stourbidge the following weekend. Monday's first round draw paired them with a return to the scene of last month's 3-0 FA Cup fourth qualifying round exit to the Glassboys.